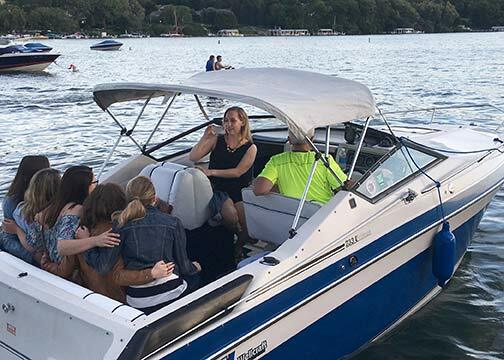 Falling in Love with Lake Geneva is easy… Maybe it’s the way the water shimmers off the Lake, a private cruise or the way the sunset hits the trees. Or maybe it’s the amazing sensation of the breeze blowing through your hair. Or maybe it’s just an afternoon relaxing, while soaking up the glorious sun, wind and waves. Whatever it is to you, Lake Geneva is very special and offers you unique events, colors, tastes and wonders throughout the year. Sparkling waters, sunshine, a cool breeze, these are the essential elements of a Lake Geneva Summer. What better way to do this than to take a private cruise along the Geneva Lake waterfront? Checkout the amazing mansions of the Wrigley’s, Maxwell, Maytag’s, Crane’s, and Harris’s, many dating back to the Chicago Fire of 1871. Enjoy an afternoon swimming or tubing. From your first dive into the sparkling clear waters of the lake, from the boat, to watching a sunset while enjoying a glass of wine with appetizer, you will know this is a memory of a lifetime. This is possible without the hassle of driving or taking care of a Boat. Captain Thom will give you a day to remember for along time. Enjoy the scenic wonders of this historic lake while relaxing and cruising. Let Thom’s years of seamanship give you a safe, carefree day, out on the water. Bring your family, friends or dog and leave your hurried hectic lifestyle ashore. Take that leisurely cruise past these grand estates. A cruise on Thom’s boat is a perfect way to celebrate a birthday, an engagement or wedding. Enjoy a very special lake with a unique excursion. Bring your friends, family or loved ones on a tour in a private chartered boat.